Club ready anthems in no time! Dom Kane is a fast rising underground talent being tipped as “the one to watch”, and is consistently growing from strength to strength. Having his productions and remixes caned by everyone from Pete Tong to Deadmau5 can only mean one thing: his star is very much in the ascendant. His sound touches everything from tech-infused progressive, to downright nasty tech-house, creating a pumped-up robo-funk engineered to destroy peak time floors with pin-point precision. 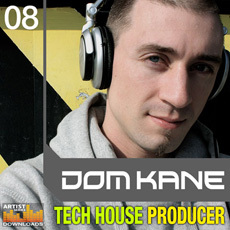 This exclusive and highly original Tech House Producer sample collection for Loopmasters Artist Series is jam packed with concentrated dance floor gems, rich song ideas, Tech House beats, minimal twists and electro house sound bytes which will have modern dance floor producers inspired and ready to roll out supercharged club ready anthems in no time! Featuring over 900Mb of original credit crunching content, and including a wealth of material for Tech House, Minimal, Electro and Progressive House producers - just like the man himself, this collection is definitely one to watch and one that people will be talking about for years to come. Using his ample talents and enthusiasm, Dom here lays down over 500 samples which consist of 130 Tech House Drumloops, 34 Add on Loops, 39 Full Loops, 27 Fx Loops, 110 Synth Loops, 135 Synth Hits, FX sounds, Drum and Percussion Hits, and 11 Multisampled instruments. With so much to offer on the cutting edge of the current dance music scene it’s no wonder IDJ Magazine rated him as: “The Year’s Fastest-Rising Underground Talent”.